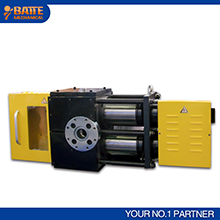 Screen changer and melt filter belongs to the Filtration Systems, which developed, designed and manufactured by Batte. Screen changers are well established in the plastic processing. The following is the details. High pressure and process constancy also during screen change. Design in each case adapted to the process with regard to filter area and pressure constancy. Pressure and volume flow constant backflush screen changers. For ensuring a high process and volume flow constancy. Any questions and details about Screen changer, melt filter, and filtration system, please contact Batte freely.